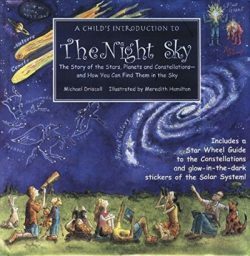 DESCRIPTION FROM THE PUBLISHER: Children eight and up will enjoy this conversational but information-packed introduction to astronomy and stargazing, which includes the achievements of the great scientists, the history of space exploration, the story of our solar system, the myths behind the constellations, and how to navigate the night sky. Whimsical color illustrations on every page and handy definitions and sidebars help engage younger readers and develop their interest. The special star wheel helps locate stars and planets from any location at any time of year. This is the third in Black Dog & Leventhal’s successful series including The Story of the Orchestra and A Child’s Introduction to Poetry.